Pricing - Mesa Properties Inc.
You don’t need to pick up the phone and listen to a long-winded sales pitch just to find out how much we charge. Below is every fee we charge. Nothing hidden. Period. The percentage that you pay depends on a couple of factors. Properties in highly desirable areas that rent for higher amounts will pay a lower percentage. We evaluate your property and provide you with a free rental analysis showing how much your property would rent for as well as a percentage for what you would pay in management fees. Finding a great tenant for your rental property is the most important and also most difficult part of managing residential homes. For this fee, we market your property on all the big sites where tenants are likely to find it such as Zillow, Trulia and Rently and then implement our industry leading tenant screening process to find the absolute best tenant for your home. We stand behind our screening process. To prove it, we guarantee that tenant for 12 months. If things don’t work out in that first 12 months, we find you another tenant for free. This fee covers renewing the lease with an existing tenant and adding any rent increases or additional terms. In most circumstances, rent can be raised 3-5% per year, depending on the market. Even a slight rent increase will cover this fee over the course of 12 months! If the tenant is moving out at the lease expiration and is a tenant that we placed, we will handle the deposit disposition for you and perform another tenant placement at the cost of our placement fee. Inspections include a detailed report with pictures on the condition of your property both inside and out. We check all of the safety related items such as smoke and carbon monoxide detectors and the water heater bracing straps. We’re also checking the general condition of the home and ensuring all terms of the lease are being adhered to. We are happy to perform multiple safety inspections per year or lease, but we won’t do them more than quarterly to respect the tenant’s privacy. 10% on initial work orders, then none! Most of the time, we don’t markup invoices, but here are the few times we do. We markup invoices by 10% for any jobs that are necessary to get a vacant property ready to rent for your first tenant. This is only when you first sign up with us. All work orders once a tenant is in place and during any vacancies going forward will not be marked up. If you sign up with us and already have a tenant in place but have a lot of deferred maintenance requiring immediate use of our vendors, we will markup invoices by 10% during the first 90 days. This a fee that only applies to owners that live out of California. Over the course of the year, we are required by the State of California to withhold a certain amount from your rent income for tax purposes. We have a rather time consuming filing process that we have to go through annually for all of our out of state owners. This fee covers our costs associated with ensuring that we, and you, remain compliant with the State of California income tax law. There are a few times where we do this for you. First off, if you are just checking us out, let us provide you with a free, no obligation rental analysis! When it’s time to renew a lease, we will provide you with what we think the rent should be raised to (if at all). And of course, any time a tenant moves out and we need to market the property again, we will provide this to you. Our team of licensed real estate agents are experts at determining exactly what your home should rent for to ensure maximum profit and minimum vacancy time. Part of our service to you is offering our seasoned advice on what you should be renting for and when it’s a good idea to raise the rent. What About Eviction Protection Plans? Well, they aren’t exactly legal. And we’re just as bummed as you are. This is one of our most requested services. We used to be able to offer owners an additional peace of mind by charging a low monthly fee and guaranteeing that we would pay the associated costs of an eviction if it ever came to that. Unfortunately, no property management company in California can legally offer eviction protection plans as services like this and any other “insurance type” guarantee is considered an advance fee and is illegal according to the California Department of Real Estate. 30 Days or Less Leasing Guarantee*: We will get a signed lease for your home in 30 days or less or you get a free month of management on us! Tenant Placement Guarantee: We guarantee any tenant we place for 12 months, otherwise we will place a new tenant for free! Satisfied Customer Guarantee: If you aren’t happy with our services at any time, all we require is a 30 day notice. No long term contract and no cancellation charges. If you aren’t happy, we don’t want you tied to us by a contract. Remember what we said about transparency? 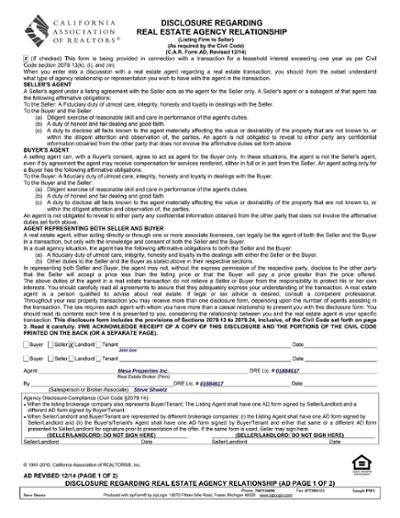 Here’s the exact contract and information request we will send you via DocuSign at your request. Customized with your information of course. Email us at info@mesaproperties.net with your information and we’ll send it right over to you. Click on the PDF image below to view.